Section 1 of the Hume and Hovell Track includes a range of different terrain from the streets of Yass, through to rural fireroads, a boat trip over Lake Burrinjuck and the iconic Wee Jasper area. The Hume and Hovell Track commences at Cooma Cottage, Hume’s main residence during his lifetime. The first 37km of track, heading towards Burrinjuck Dam, is on public roads with only light traffic. The track heads west along the Yass Valley Way towards the Hume Highway. 5.6km from the centre of Yass, the track turns left onto Black Range Road and follows this road for a further 22.2km to the first campsite: The Captain Campsite. From The Captain Campsite, the track continues to follow Black Range Road until the intersection with Burrinjuck Road. It turns left and follows Burrinjuck Road for 9km, and then left again onto Waterview Road. This road then enters Burrinjuck Nature Reserve along a rough bush track. A benched foot track then drops down to Lake Burrinjuck. Near the shore, a foot track is used to pass around Carrolls Bay to reach Burrinjuck Waters Holiday Park. From here, a boat service is used to cross Lake Burrinjuck, a journey of 6-7km taking approximately 15 to 20 minutes. The boat is usually available on Mondays and Thursdays for track users, or by special arrangement for groups. Boat bookings are essential - please call (02) 6227 8114 to arrange timings. There is a charge of $40 for the boat journey, payable at Burrinjuck Waters Waters Holiday Park. This includes camping at Burrinjuck Waters Holiday Park the night prior and use of their facilities, including laundry and showers. Small change is required for these facilities: 20c for showers and $1 for laundry. A kiosk is also available which stocks staple groceries and provides hot meals. Please note the shop shuts at 5pm on Sundays. For further information visit their website. The disembarkation point is near Cathedral Rock. From here, a vehicular track is followed south for 4km to intersect with a sealed road near Carey’s Cave. The track takes Cave’s Road into Wee Jasper, passing Barber’s Bay near Carey’s Cave and Carey’s Reserve, a public camping ground used by campers, fishermen and water sport enthusiasts. From Carey’s Reserve, it is 2.1km to Wee Jasper Village and then only a short distance to the entry of Wee Jasper Nature Reserve. From Wee Jasper two track options exist to get to the Fitzpatrick Trackhead: straight along Wee Jasper Road, or on a foot track through the Wee Jasper Nature Reserve. The foot track heads into the reserve and climbs steeply over a stony ridge covered with a dry sclerophyll forest. In spring and early summer the wildflowers are very attractive. From the top of the ridge, looking back towards Wee Jasper, there are some good viewing points to take a breather and view the village area and the Goodgradigbee Arm of Lake Burrinjuck. The track descends down the western side of the ridge, crosses Wee Jasper Creek and reaches the Wee Jasper Road. From here the track heads left along a foot track for 1.5km to Fitzpatrick Trackhead, or straight ahead to skip the Trackhead and continue on to Mt Wee Jasper on Map 2. From the Fitzpatrick Trackhead, the track heads west through fairly rocky terrain before meeting up with Wee Jasper Road, and the junction of the walking track through the Wee Jasper Reserve. The next 6km of the track is all uphill to the summit of Mt Wee Jasper (1,121m). Views from the top of Mt Wee Jasper are restricted, but the climb does offer a rest stop and the chance to sign the visitors’ book, located in a white, plastic container. It’s the first of several such log books placed on the track. From Mt Wee Jasper, it is 4.8km to Log Bridge Campsite through mostly eucalypt forest and sometimes along the edge of pine plantations. The campsite is a good one to spend the night. If you are not camping here, it’s another 13.1km to Micalong Creek Campsite. The section between these two campsites follows Millers Creek and back up Pompey Pillar Creek on a single track in fairly challenging terrain. A six metre high natural column of rock (Pompey’s Pillar) halfway up Pompey Pillar Creek is just one of the features of this section of track. Where the track reaches the Micalong Station on Four Tree Rd, turn sharp right and then sharp left onto a 4WD track which runs alongside Micalong Creek. Forestry roads following the creek are used to reach Micalong Creek Campsite. The track continues to follow Micalong Creek, both on forestry roads and foot track. For several kilometres the track is no more than 50m from the creek. A kilometre further on from here you will reach the Brindabella Road, which is one of the best all-weather access roads to the track. Approximately 3km south of Bossawa Campsite a boardwalk crosses the Micalong Swamp, which is near the explorers’ original crossing place. The track then follows a firetrail for 2.5km before a boardwalk across the Chinaman’s Creek arm of the swamp, which is also used by some wildlife to make a dry crossing. Just beyond the boardwalk there’s a clear, level area that’s suitable for camping. The descent from the tableland to the Goobarragandra Valley, passing through The Hole, is on a foot track and is a favoured section for many track users. It is then approximately 6km over undulating terrain to the Thomas Boyd Trackhead. The Thomas Boyd Trackhead is one of the most used facilities on the track. It’s popular with walkers, campers, fishermen, picnickers and car-bound tourists. The campground is managed by the Goobarragandra Valleys Trust and camping fees will apply. More information is located here. The first of two bridges, the Norm Harris Bridge, is within the trackhead grounds and crosses the Goobarragandra River. A foot track follows the river bank for about 4km to recross the river at the second bridge, the Jack Cribb Bridge. After the second bridge the track continues for a short section in a reserve, then on a the Goobarragandra Rd, before dropping down to cross Buckleys Bridge over the river. From there a public road, passing through grazing properties, becomes the walking track for about 6km. Just before reaching the heavily timbered country there’s a resting spot under some elm trees near the junction of Mill and Walls Creeks. The track crosses Walls Creek and then climbs steeply for about 600m before briefly entering Kosciuszko National Park. Signs and logos take walkers along a fence towards Foxes Gap saddle, you go over a stile at the fence and then head down a rough 4WD track. The next 5km is through fairly open grazing land until it reaches the Snowy Mountains Highway - the start point for the next section covered by Map 3. From the Snowy Mountains Highway the track is signposted via quiet roads south of Tumut until reaching Blowering Campsite on the northern end of the the Blowering Reservoir. From here, it’s 9.4km along single track to Browns Creek Campsite along to the western shore of the reservoir. Beyond Browns Creek Campsite, the walking track continues along forestry foreshore firetrails of Blowering Reservoir. Camping is not permitted in the pines, but there are a number of excellent campsites between the road and the water. Most have grassed areas, excellent shade trees, picnic tables and toilets. At the southern end of the reservoir, the track climbs Gurkeroo Ridge and passes through Benjamin Smith Campsite before reaching the water of Jounama Pondage. The track continues through open farmland to the west of the reservoir for a couple more kilometres across open country towards the densely wooded base of a climb that leads into Kosciuszko National Park. The park boundary is approximately 500m in from the fenceline and the track heads towards Buddong Creek and eventually Buddong Falls. Approximately 5km after entering the forest is the Buddong Falls Picnic Area requiring a tough 300 metre climb. A short side track, on the right, can be used to access the Lower Buddong Falls. 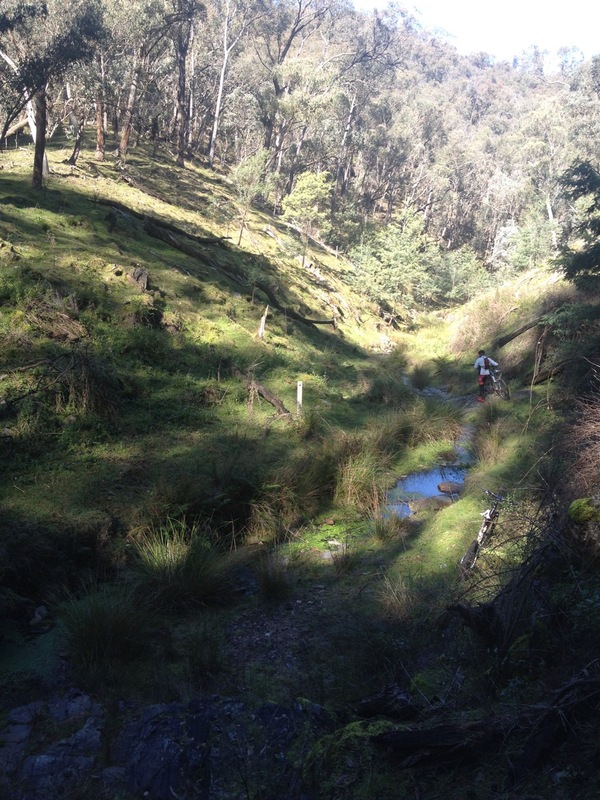 After crossing Buddong Road, the track continues to follow Buddong Creek upstream on a short length of single track through some dense eucalypt forest before emerging on firetrail and crossing it again at Buddong Hut. The track continues to Paddys River Dam Campsite, mostly on single track, which is about 14km from the Buddong Falls Picnic Area. From the dam the next 15km of the track is on, or close to, the old water race. The more open areas around Paddys River Dam and Coffee Pot are a favoured haunt for brumbies, and the area supports a large and diverse bird population. When Middle Ridge Road and West Burra Creek are reached, you exit the Bago State Forest and enter private pine plantations and later on, grazing lands. evidence of extensive mining operations (gold and tin) will be seen as the creek is followed. Junction Campsite, at the junction of east and West Burra Creeks, is 22km from Paddys River Dam Campsite. It’s another 6.5km, through areas worked and reworked for gold and tin, to reach the Henry Angel Trackhead which is on Tooma Road, 8.6km from Tumbarumba and the gateway to the next section on Map 4. The initial part of this section of the walking track has been designed as an easy and interesting day walk. It’s on a foot track following Burra Creek which, over 100 years ago, was an important alluvial gold and tin mining area. The mining changed the creek and the surrounding countryside extensively and descriptive plaques will help to make the mining activities clear to walkers. Note the channel that has been cut through the rock. It’s hard to believe that these vertical rock walls are the result of the controlled use of dynamite. This cut, and other cuts upstream from it, were made so that upstream deposits (soil, sand, gravel, rock, tin and gold) trapped behind rock bars could be sluiced downstream and the gold and tin trapped. 4km from Henry Angel Trackhead, just north of the junction of Burra Ck and Tumbarumba Ck, the falls described by Hovell are reached. Beyond Tumbarumba Creek, you enter the Bogandyera Nature Reserve. It’s a long climb to the top of the next ridge then an equally long drop down the other side to Mannus Creek, which contains the backed up water of Lake Mannus and is a haven for waterbirds. From Mannus Lake Campsite (which offers waterfront views) a foot track along the edge of Mannus Lake is followed and then a gravel road is used to reach Mannus Campsite, a further 5.5km. From here it is 8km by road back to Tumbarumba. The next 25km of the walking track is in Mannus and Mundaroo State Forests. Mundaroo Campsite is 12.4km from Mannus Creek Campsite but there are a couple of other spots to camp along the way. Upon reaching the western boundary of Mundaroo State Forest, walkers will be above Carboona Gap on Jingellic Road. There’s a stile to help negotiate the fence and a visitors book, ready for perusal and signing, in a plastic tube. About 11km of the track beyond Munderoo State Forest is within the private property, ‘Clear Springs’. Please be reminded that you must stay on the track and not disturb stock. Camping and the lighting of res are not permitted on private property. The track crosses Coppabella Creek and then circles around the end of a ridge and heads back up Lankey’s Creek. The track crosses the creek and goes out onto the Jingellic - Holbrook Road, which has to be used for about 3.5km to reach Lankeys Creek Campsite. The campsite is a pleasant spot for an overnight stay. This must have been close to the explorers resting place where Hovell made a lengthy entry in his journal describing how the flies and mosquitoes were making conditions unbearable. The walking track from Lankeys Creek to Albury is in much drier country and the forest, both eucalypt and pine, is much more susceptible to bushfire. The track through this section is more susceptible to bushfire than some of the northern sections. After leaving Lankeys Creek Campsite follow the sealed Jingellic Rd for about 300m towards Holbrook. From here turn left onto a forest access trail. The track takes a steady uphill grade towards the west through a pine forest for 4km before reaching Woomargama National Park. The track follows Tin Mines Road from the entrance to the park right through to Samuel Bollard Campsite, just west of Tunnel Rd. There are some wild flowers along this entire section of track plus many wattles, bearded heath, handsome flat pea, and sarsaparilla. Beyond the Mandaring Trail intersection (to the north of the track) the road starts to descend and after about 4km you will reach a clearing containing Tin Mines Campsite, which is about 20km from Lankeys Creek Campsite. The campsite comprises a large open area and includes a picnic shelter with water tank and pit toilets. From here, the walking track continues to use Tin Mines Road running east-west through Woomargama National Park. Track junctions carry Hume & Hovell Walking Track signs and the with logos. There’s a long, steady climb over 8km from Tin Mines Campsite to the top of Mount Jergyle allowing for glimpses of Mount Narra Narra and Mount McLaurin on the right from the lookout. From Mount Jergyle the track runs almost west along a ridge for 3km until it drops into the valley of Home Flat Creek from where there may be glimpses of the water in Hume Reservoir to the south. About 20km from the Tin Mines Campsite you will reach Samuel Bollard Campsite. The campsite is 1.6km short of Tunnel Road. The walking track continues, on a single track, to Tunnel Road, which it crosses and following a general south-westerly course, as desired by the explorers, continues on to Albury. From Samuel Bollard Campsite located on the previous section, a foot track meets Tunnel Road after about 1.6km and continues on a fire trail on the southern side of Tunnel Rd for about 300 metres. At a sharp left hand turn on the dirt road, the track continues straight ahead (west) onto a foot track which continues into the Woomargama State Conservation Area. The track comprises about 4.5km of single track through to another fire trail which skirts the southern boundary of the Conservation Area before emerging from the forest into private property, approximately 8km from Wymah Rd. Part of the track here is near the timberline, running along farm fence lines, but much of it is out in open, undulating country. The walking track comes out onto Wymah Road which is followed west for about 7km. Just before Fowlers Swamp Creek, the entrance to the Great Aussie Holiday Park is located on the left. This is a privately owned holiday resort with a variety of accommodation available. Three hundred metres beyond the bridge over Fowlers Swamp Creek, access to Ten Chain Stock Reserve which runs parallel to Wymah Rd for almost 6km before joining Bowna Rd - the Old Hume HWY. The next section of track, about 4km, follows the old Hume Highway, then a service road (Clancy Rd) parallel to the highway for 3.8km. At the Burma Road junction the track heads down Burma Rd, generally heading south for another 8km and generally uses back roads between the Hume Highway and Hume Reservoir as it moves towards the Albury suburbs of Thurgoona and St Johns Hill. Camping, for track walkers only, is permitted at Table Top Park. Look out for the Ettamogah Pub about halfway through this section, 1km to the west of the track. Generally the walking track between Budginigi Hill and the Hovell Tree uses road reserves and other local trails established Parklands Albury Wodonga. The track does twist and turn to some degree and signposting indicates the route to be followed. The walking track comes out onto the Riverina Highway which is followed for 3km along a new cycle path until a road on the left leads to the Mungabareena Reserve on the northern bank of the Murray River. The expedition moved upstream, along this bank, looking for a crossing spot on 18 November 1824. You are not permitted to camp on the Mungabareena reserve. A foot track leaves the reserve to climb to the top of Eastern Hill and then drops down to cross the Hume Highway. Eastern Hill provides an excellent vantage point for the whole region. Walsh, Schuback, Amatex and Hume Streets, in Albury, have to be used to cover the final few kilometres to the Hovell Tree via South Albury and Noreuil Park and the southern end of the Hume & Hovell Walking Track.